Cllr Adam McVey, Leader of Edinburgh City Council. Mark Lazarowicz, former Council Leader and Leith MP. 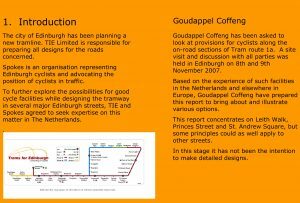 It’s great to get these compliments – but even more important is the fact that 8% of trips to work in Edinburgh are now by bike compared to 1% when Spokes was founded, whilst in Scotland as a whole bike modal share hardly moved over the same period. 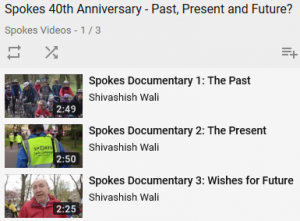 Something special happened in Edinburgh – Spokes is proud to have been a part of it, and proud that it is now spreading to other parts of Scotland. Transcript of Cllr McVey speech and slides used in Dave du Feu speech. The posters (and other elements of the exhibition where possible) will circulate round a range of libraries and other public venues in the coming months – please contact us if you can provide a venue used by significant numbers of the public. Exhibition dates and venues are on our history page [2nd bullet point]. Thank you to Sustrans Scotland and Edinburgh Bike Co-op who helped support production of our anniversary materials. 2016 – Failure of joint campaign with Living Streets to prevent the scrapping of Saturday and off-peak bus lanes. Nowadays it’s almost impossible to appreciate just how bike-unfriendly Edinburgh was in 1977. For all the problems, we’ve come a huge way since then! 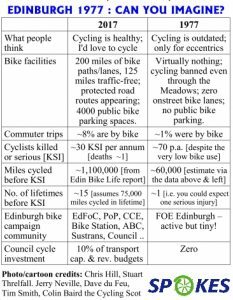 Most important – contact your councillors or MSPs every so often about local or national cycling issues that concern you – either by email or, even better, visiting their surgery for a chat. By contacting them, you not only raise a specific issue, but you add to their awareness that their voters want the maximum attention given to improving cycling conditions – and that helps maintain political support for decent cycling budgets.